When it's time for concrete, remember our trailers can hold up to 1 yard, and you don't have to start working until the concrete is out of the trailer. To use the Concrete Calulator, first choose either Slabs, Footings or Columns, then enter the thickness, length, width, depth, height and/or diameter (depending on your project) and press Calculate. Your results will include not only the Cubic Yards you need, but also how many Pre-Mix Concrete Bags you'll need. 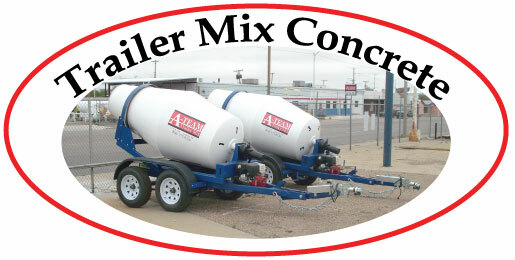 For your next concrete project, turn to A-Team Rentals in Amarillo TX - we've got you covered!